I’ve visited it extensively over the last three weeks. 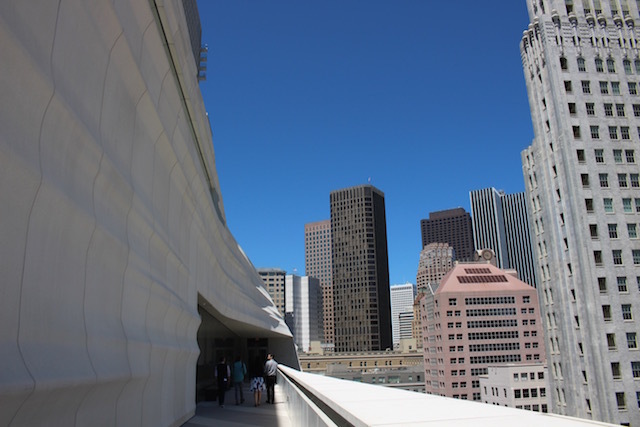 This week, I’ve written and listed in detail how to survey and visit and get the most out of SFMOMA. 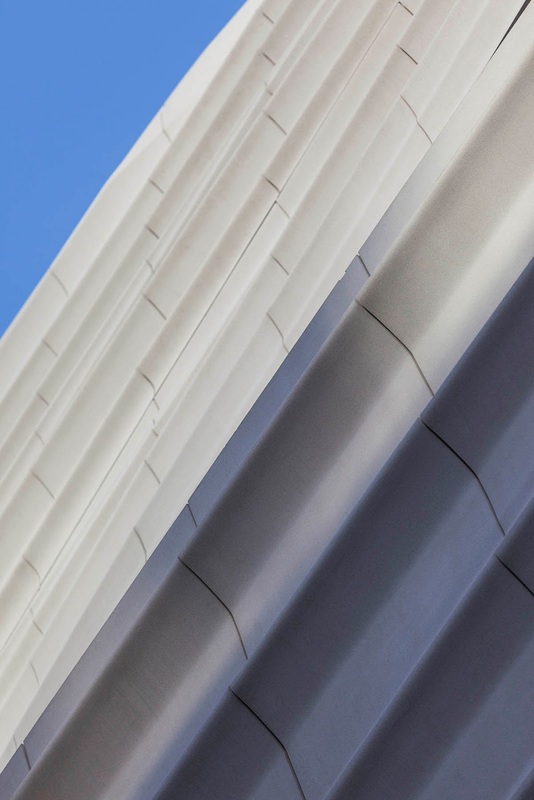 The museum is complex, massive, and rich in major art and ideas and new concepts. 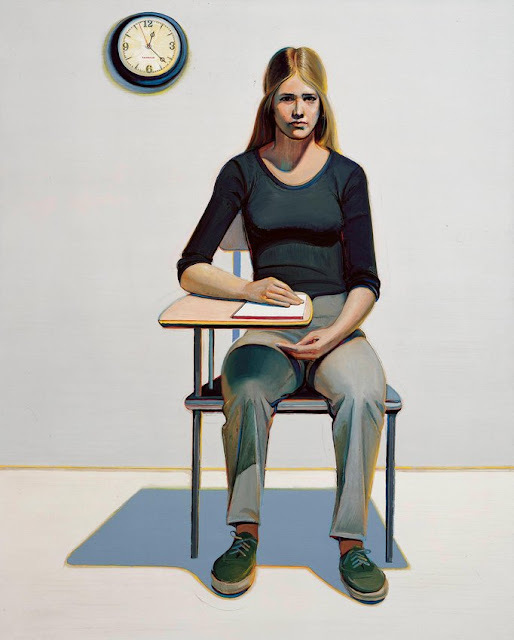 I don’t want you to miss Agnes Martin’s gallery, Gerhard Richter’s portraits, the Typography show (featuring Jony Ive’s iPhone), and Wayne Thiebaud portraits, a rare Andy Warhol ‘Mao’, and the lyrical paintings of Brice Marden. 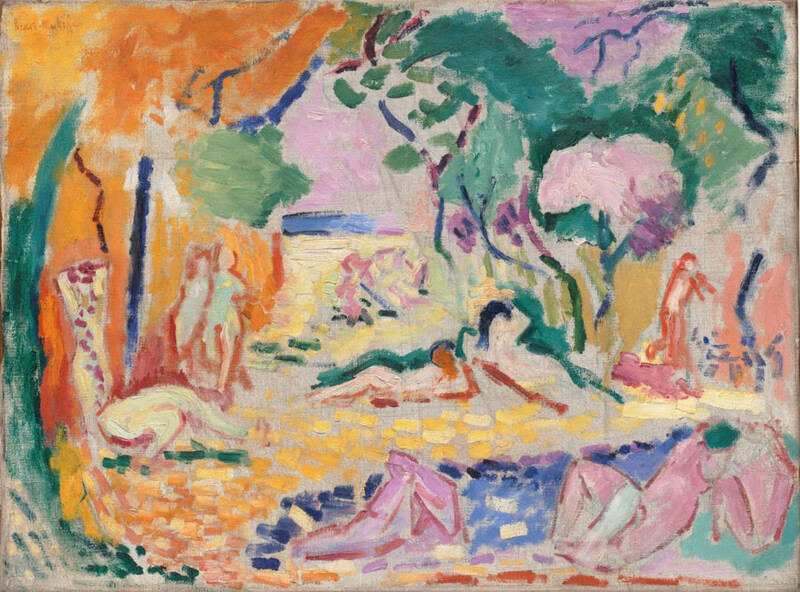 Matisse, Cezanne and Picasso are here. And Sightglass coffee. You’ll need it. Set aside a full morning or afternoon. Book a timed ticket. And plan to take in an artist lecture, a curator talk. 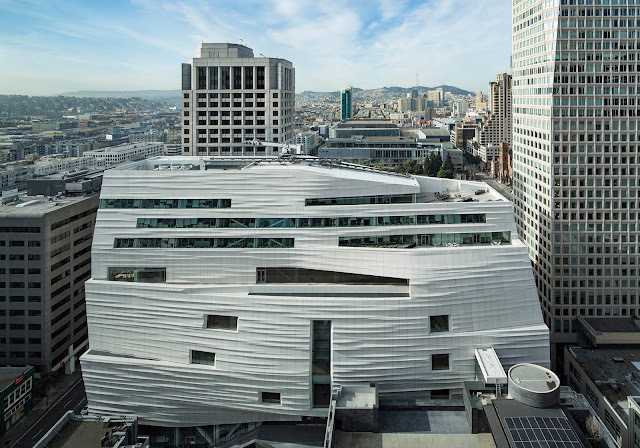 SFMOMA: The new 10-floor addition floats across the city skyline like a giant Christo wrapped monolith. At night the pale grey exterior hovers in the fog. 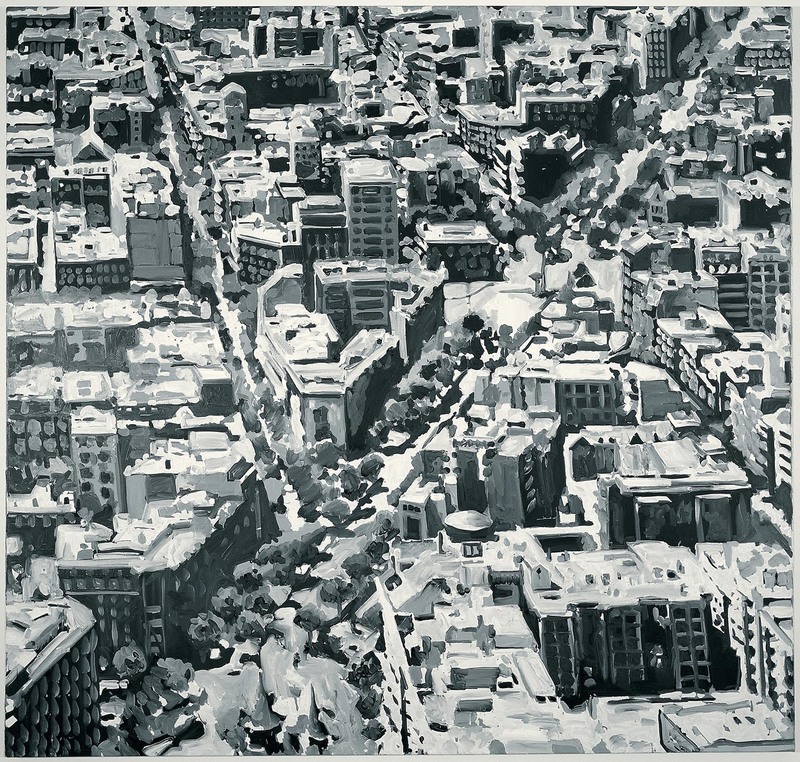 It’s located at 151 Third Street, between Howard and Mission Streets. 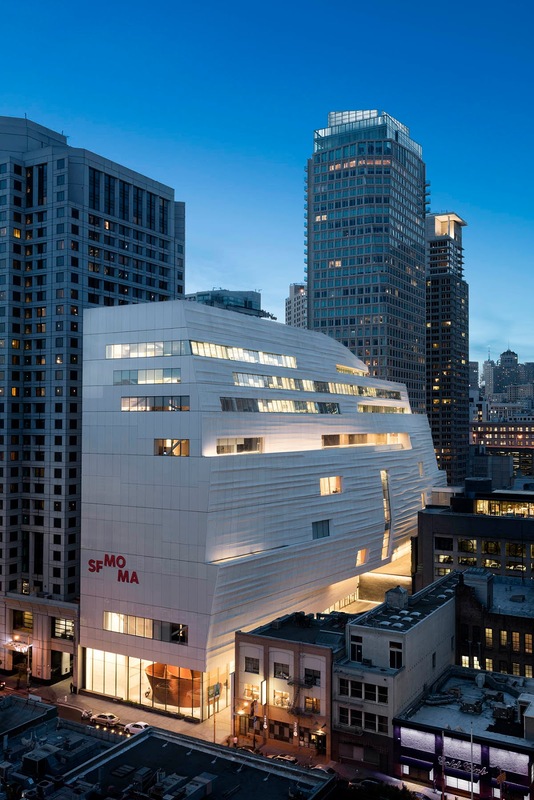 The new addition to SFMOMA makes it one of the largest modern art museums in the world. It was designed by Snohetta, the acclaimed American/Norwegian architects. I’ve figured out a great tour for you. The international art world is abuzz with the opening of the newly invented museum But, with seven floors of exhibits, nineteen dramatic inaugural exhibitions, multimedia, and 1,900 art works on show, new galleries, new collections, and superbly shaped interior architecture—where do you look, what do you see first, where do you linger, and especially where do you start? In five recent visits to the museum, I’ve planned your first visit. This is a long and detailed post. Print out this post and take it with you on your first visit. I describe the secret places where you can see favorite pieces, corners where you can disappear, terraces where you can go out and see the city, and rooms to sit in the dark, commune with art greatness, and fall in love with paintings and art works that inspire reverie, laughter, knowledge, and entertainment. Come with me for an art feast—and find the great artists, pleasures, delights, and discoveries and have lots of fun (and a restorative hand-crafted coffee). Give yourself about four hours. And bring a protein bar or two, or an apple, a pocketful of almonds. The café (called Café 5) is located on the 5th floor next to the 5th floor garden/sculpture terrace. Catering by McCalls. The much anticipated restaurant, In Situ, designed by Aidlin Darlin, with chef Corey Lee, opens soon. The sculpture terrace on the seventh floor. Go outdoors, view SOMA from above. My SFMOMA private tour starts on the 7th floor. Take an elevator to the 7th floor, and after a quick glance at the Jeff Koons flower bouquet sculpture, turn left. Stop and sit on the window ledge to gaze out. 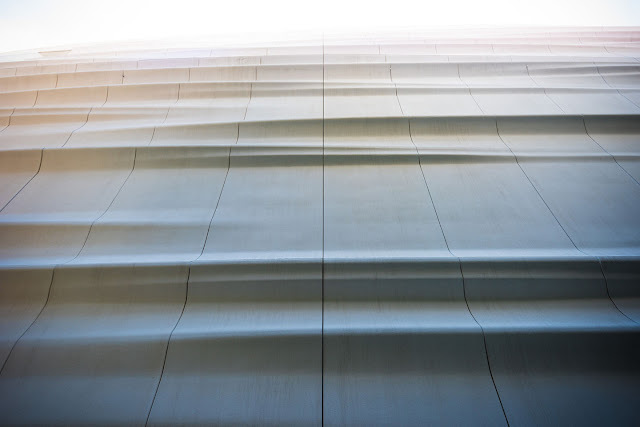 These wide-ledge windows are a handsome feature of the new museum, allowing cityscapes and a place to loll and linger.Head to the pair of glass doors leading out to the Sculpture Terrace directly outside. You are high on the building's north wall. Enjoy the unexpected city view, with historic brick buildings and narrow alleys, a very fascinating sense of place. Ponder and muse over the relationship of the museum with this formerly gritty section of town, now full of tech offices. Walk through the provocative Mimi and Peter Haas galleries. 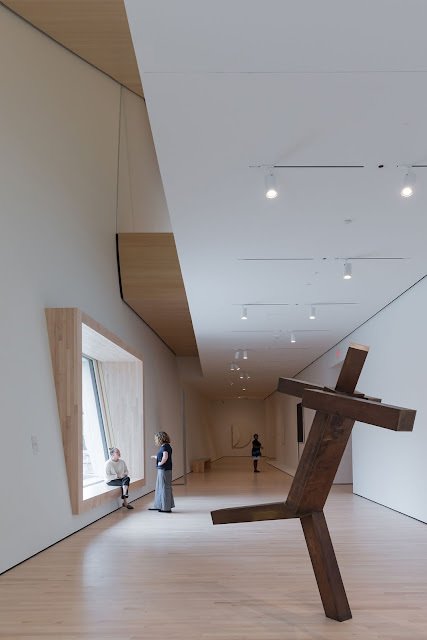 Note the Sherrie Levine small sculpture, a wooden cradle. 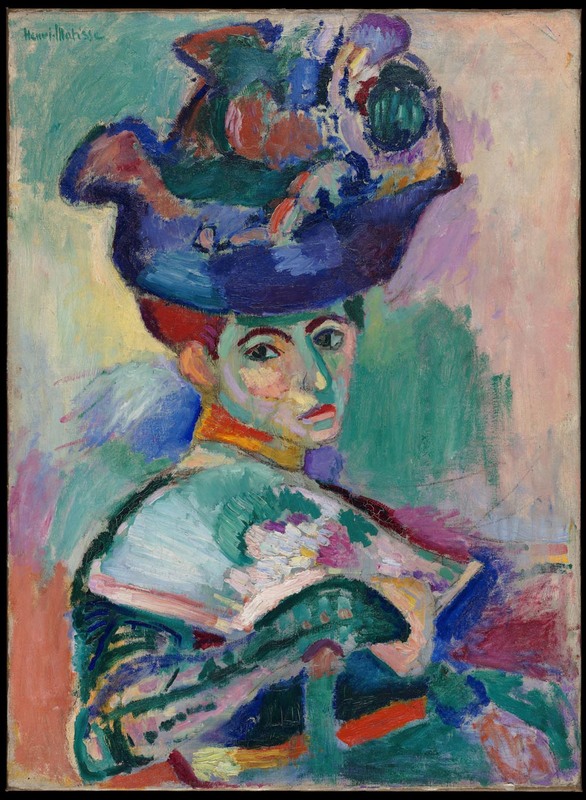 Note: Mobile apps and links throughout the galleries offer more information about the works of art. I propose for the first visit, use these minimally. 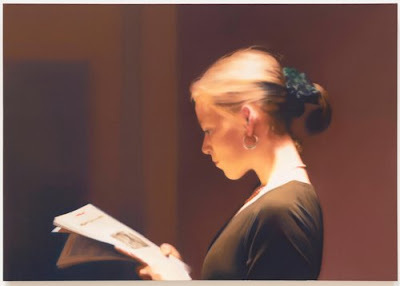 They distract more than inform…and they break your reverie and close relationship with the art. Take the stairs down to the sixth floor. The stairways are off-kilter, soaring, and thrilling. 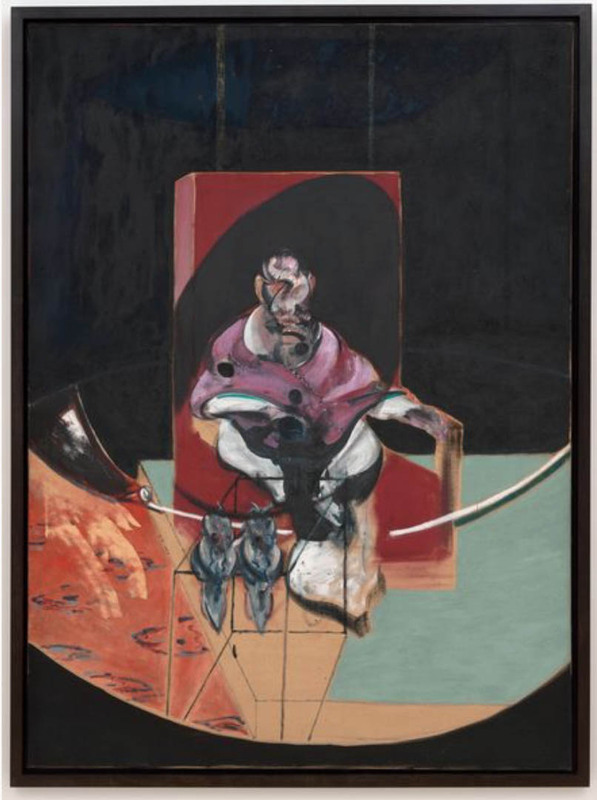 View the magnificent Fisher Collection with its thrilling monographic galleries. Start by reading the museum notes, beside ‘Zwei Kerzen’. Immediately turn left and head toward the window—then turn right and walk down the long, elegant wall to the end. This is a quiet moment. Turn right into the gallery of photography by Bernd and Hilla Becher. 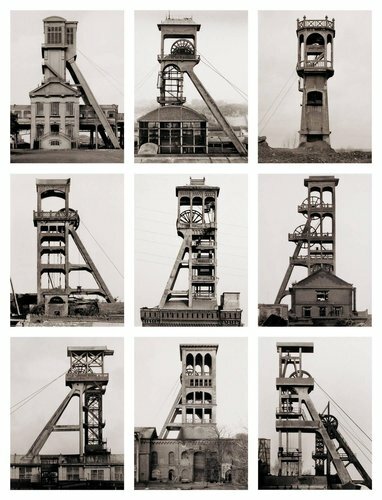 The highly admired German couple photographed industrial structures—and in turn taught and inspired photographers Thomas Struth and Andreas Gursky, who are shown in the following galleries. Take a seat. The museum has many leather-topped benches. 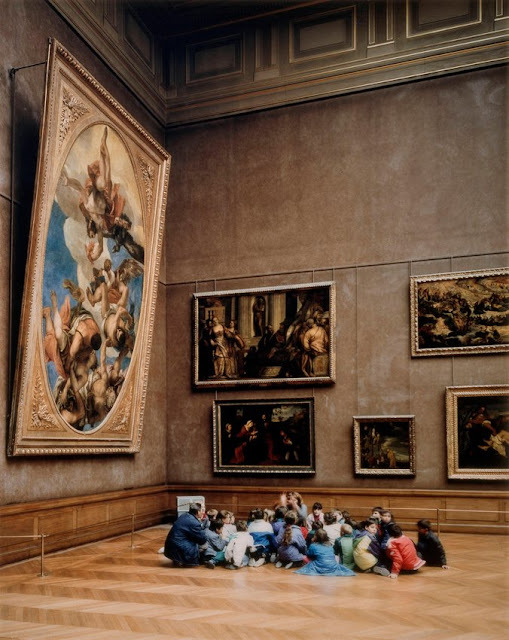 Ponder the Struth photograph of a Louvre interior. Magnificent. 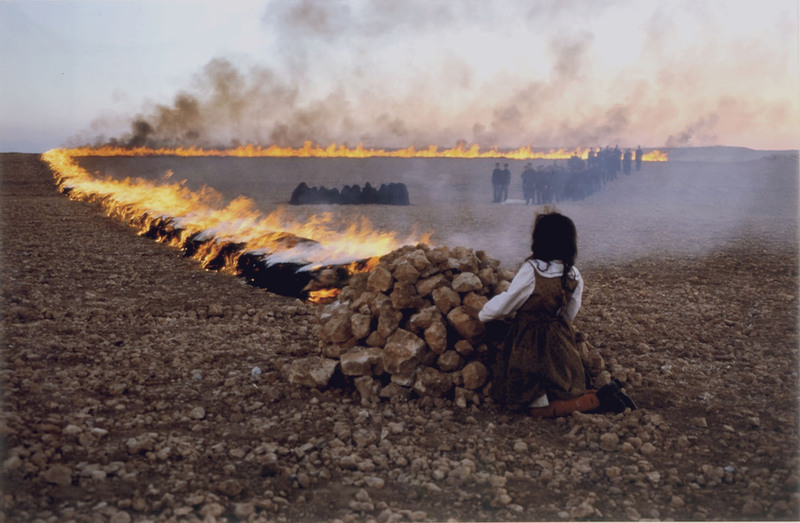 Turn left into the Shirin Neshat video gallery and disappear into the darkness to watch her thought-provoking film, with a soundtrack by Philip Glass. Mesmerizing. 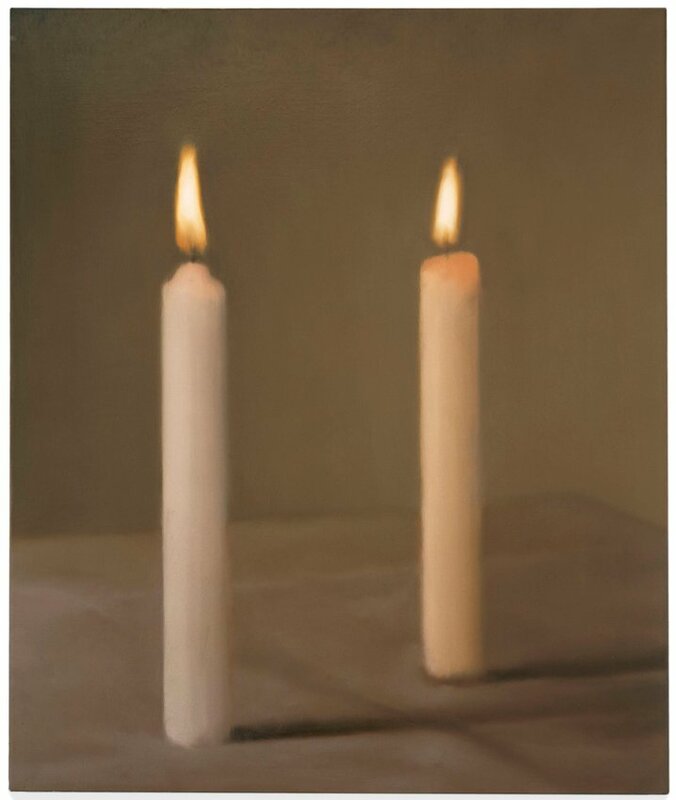 Move swiftly to one of several Gerhard Richter’s galleries to ‘Lesende’, his wife. Take a seat, and muse on this ravishing portrait, referencing Vermeer. Study his other portraits. It’s at this point, brain abuzz, that close reading of the many of the gallery paintings reveals the profound influence and imprint of photography on art, on paintings, on concepts of art, and on our way of experiencing paintings and art works. Then at the entrance to these German art galleries, take a new look at ‘Zwei Kerzen’. Upon exiting, turn right and near the window, turn left into ‘Typeface to Interface’, a fantastically intelligent and wide-ranging show. It shows chic portable Olivetti typewriters, as well as Haight-Ashbury classic psychedelic posters, subway maps, early Apple computers, and then the triumph of Jony Ive’s iPhone. The superb show is an elegant homage to San Francisco and especially to Silicon Valley and its genius world-changing ideas, fixations and brilliant risk-taking. 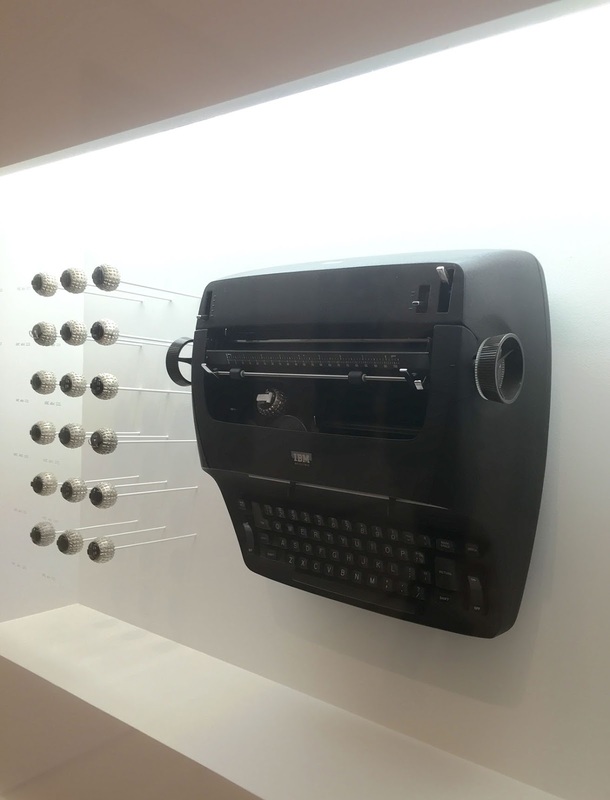 Watch at the exit for riveting computer-designed, chalk-crafted calligraphy on a black wall. It’s by Jurg Lehni. Head down to the fifth floor, taking the stairs. “SFMOMA is an extraordinary, submersive universe. It’s important to be open to experiencing everything.”—Artist José Arias, who is a member of the ‘visitor experience’ team. Team members are the helpful and incredibly knowledgeable and charming people in red t-shirts, who guide and advise visitors. Look for them near the elevators. Oh, and ask for José Arias. He’s such good company. Walk down the north hallway. It’s angled. Stop and look out the windows. These ‘interim’ spaces are Snøhetta at its best. Thank you, Craig Dykers. At the end of the hallway turn right, and scope past Dan Flavin, Frank Stella, and Sol LeWitt. Pause to muse on Chuck Close’s portraits, powerfully presented here. 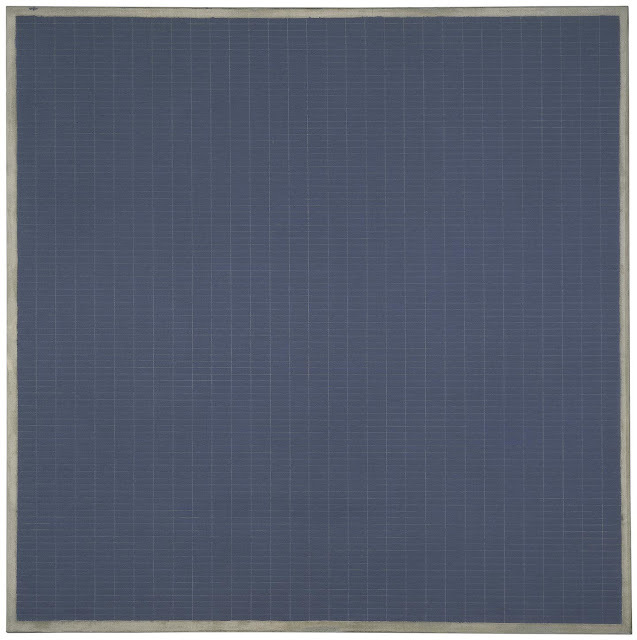 I love his portrait of Agnes Martin, and the devotion, discipline and exuberance of the painting. 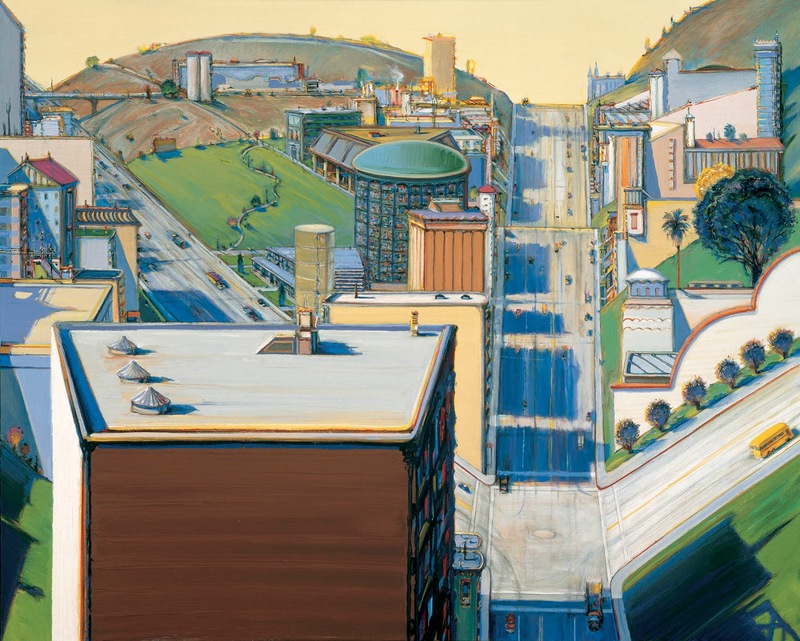 Wayne Thiebaud’s portrait and landscape are here. He’s 96, and full of spirit. I met him at one of the opening parties. David Hockney has a small figurative piece here. 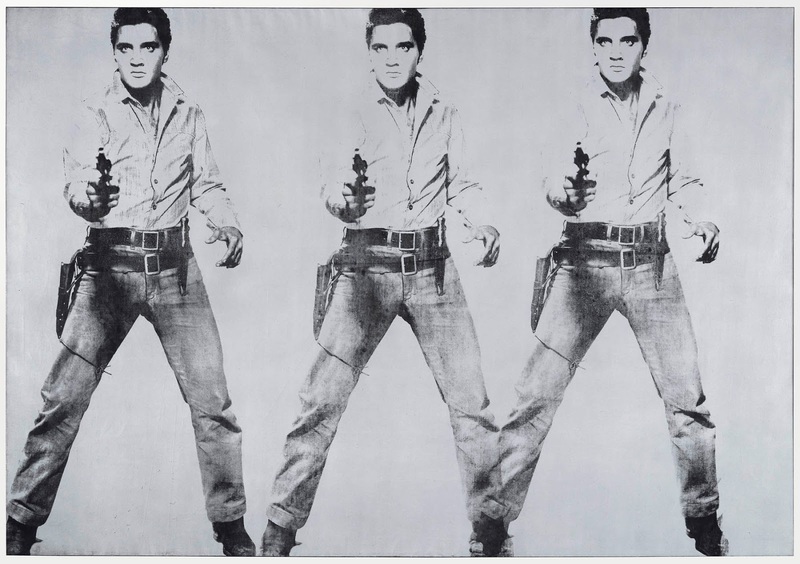 Andy Warhol is a powerful presence—with works that are powerful and engaging. “Triple Elvis’ (a popular selfie background), and ‘Jackie’ and tuna cans all here. Pause. It’s a treat. 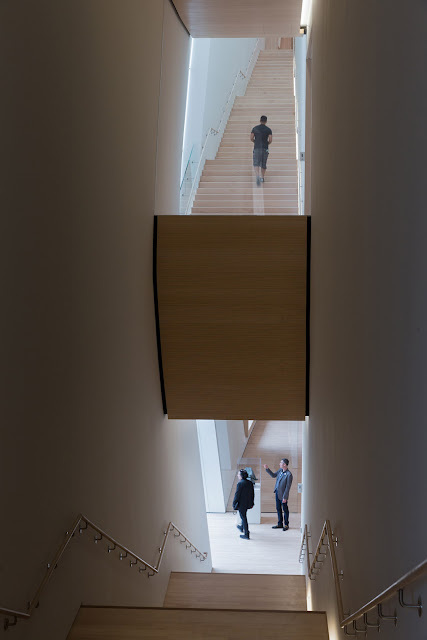 Before exiting 5, scope around to the Oculus Bridge in the Botta building. 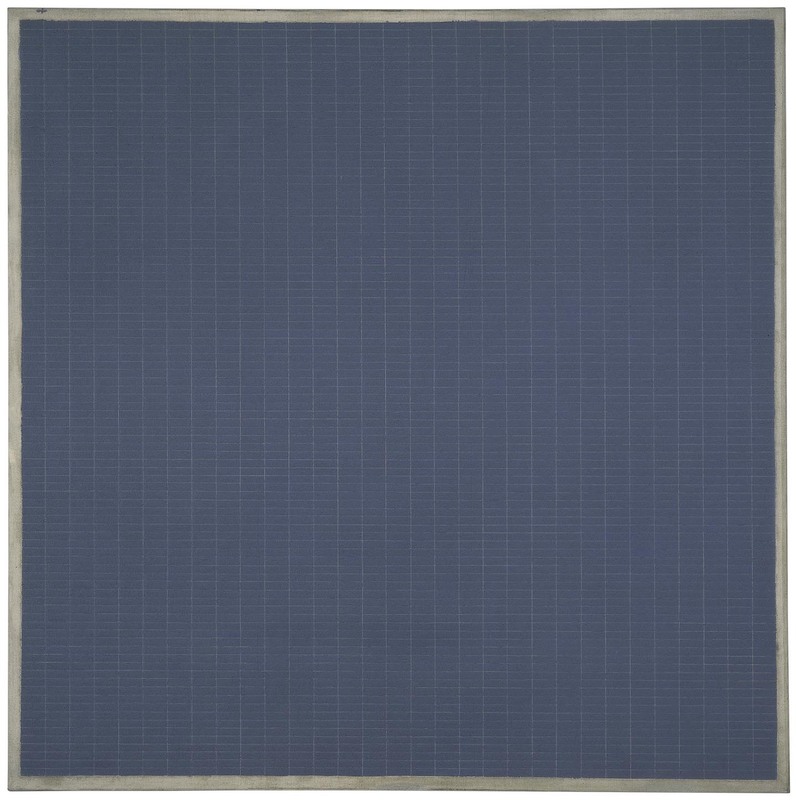 Walk down the hallway, pause at the windows, then head through the Ellsworth Kelly galleries to the Agnes Martin ‘chapel’. 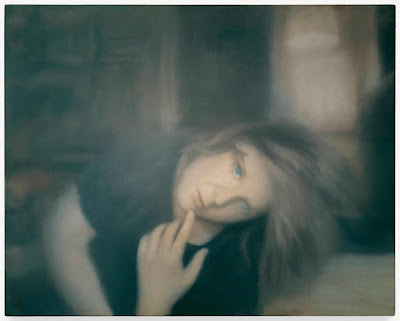 Take a place on the ottoman, and lose yourself in her peerless abstractions (a favorite of Doris Fisher). 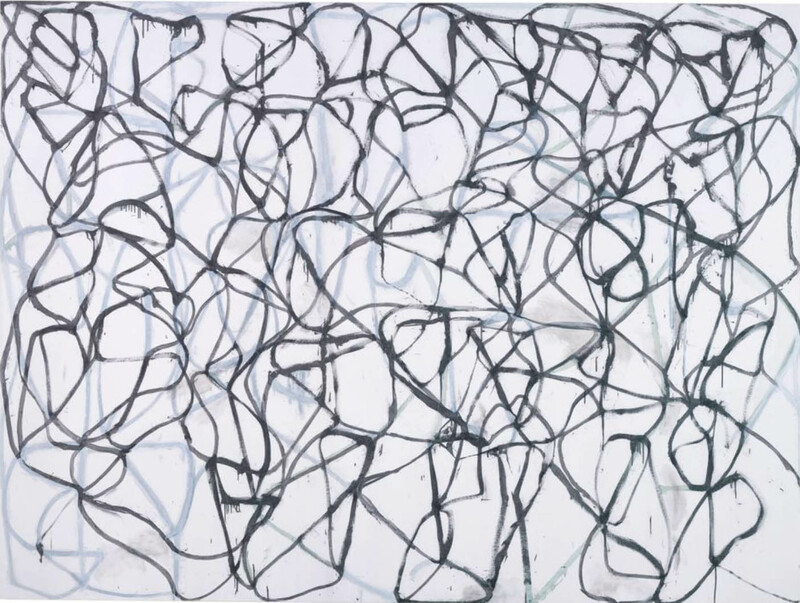 It’s pure poetry, pure abstraction. It calms the brain and eye. 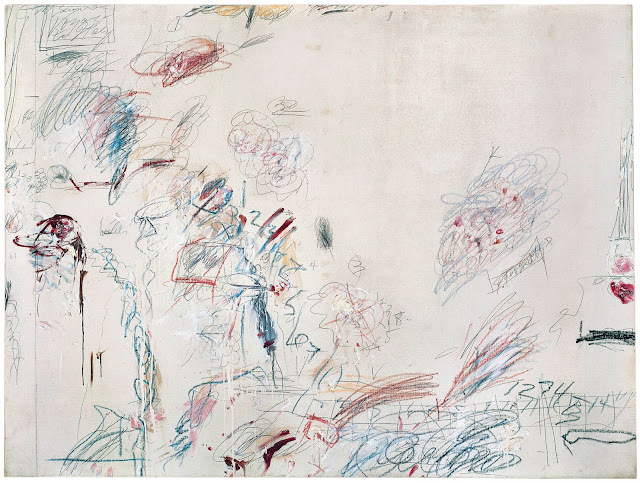 Pass then to two of my favorites—Cy Twombly and equally Brice Marden. Rest and reflect. I had the pleasure to meet Brice at an opening party. 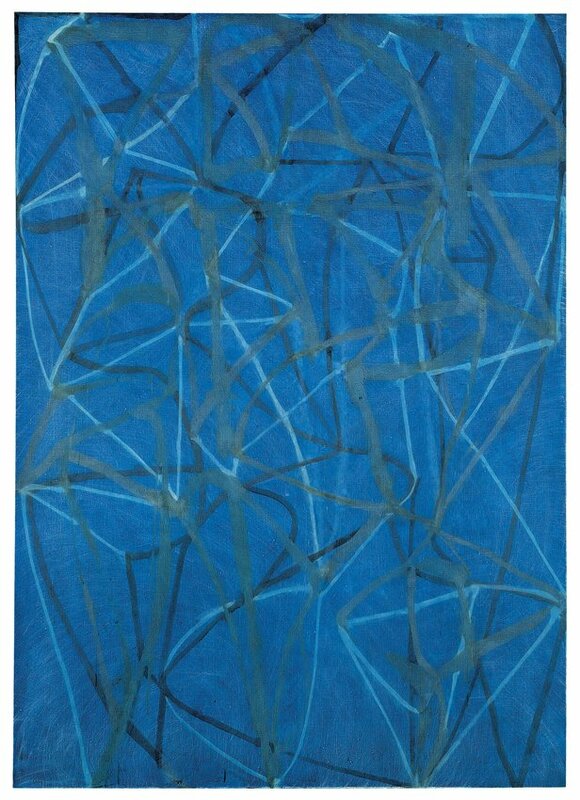 His ‘Cold Mountain 6 (Bridge) recalls Pollock and Twombly, and seascapes, air, calligraphy, light, and pure poetry. Circle to the Francis Bacon portrait, and the Fernand Leger portraits. Compare and contrast. Walk down the stairs to the third floor and speed to Sightglass café. I hope there are pastries from Patisserie B for you. Watch the baristas handcraft your latte. Take a seat. Wander freely through the photography galleries. The world is here. Larry Sultan’s work is a favorite, and these galleries are rich. Then head over to a small gallery for ‘Model Behavior’ the inspiring exhibit that shows how Snohetta invented SFMOMA. First concepts –which look remarkably like the finished museum—were improvised in foamcore, tissue paper, wood, resin, cardboard and wood. It’s a fantastic metaphor for creativity in action. It’s here that you’ll take an inspiring look back—at painting, at Matisse, Cezanne, and Picasso—and the magnificent Rothko. View Frida Kahlo and Diego as well. You could spend hours here. Moments of bliss. 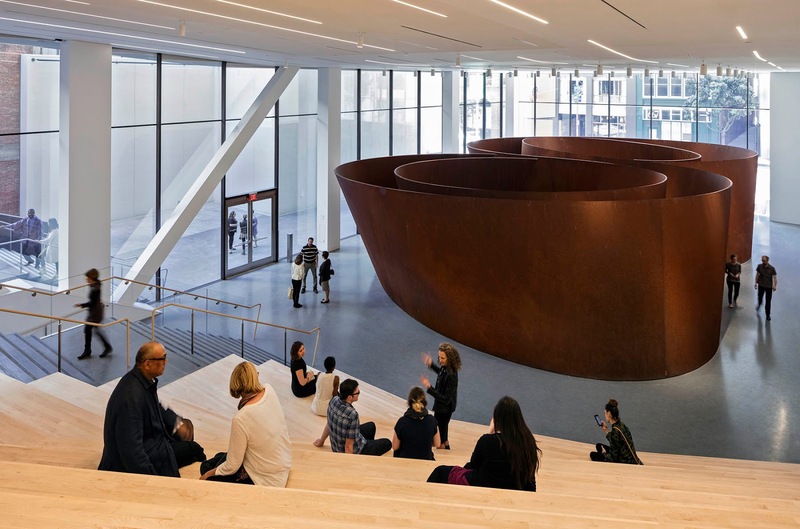 And then walk toward to Howard Street entrance—to sit on the steps above the marvelous Richard Serra sculpture. 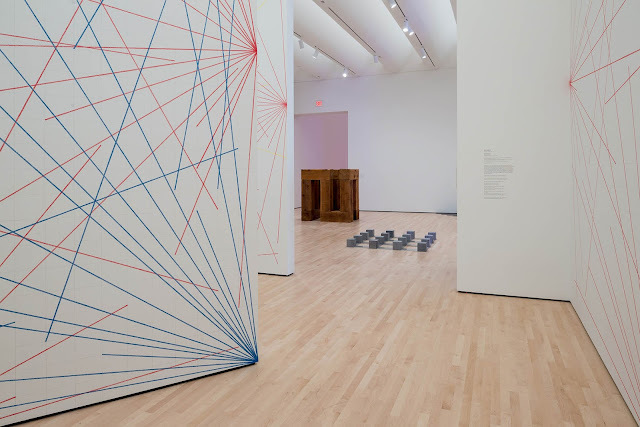 This is a marvelous museum moment, and perhaps it is time to munch on your protein bar, as you reflect on your SFMOMA day. Head back into the bustle and blur of San Francisco. And come back soon. There is so much more to see. 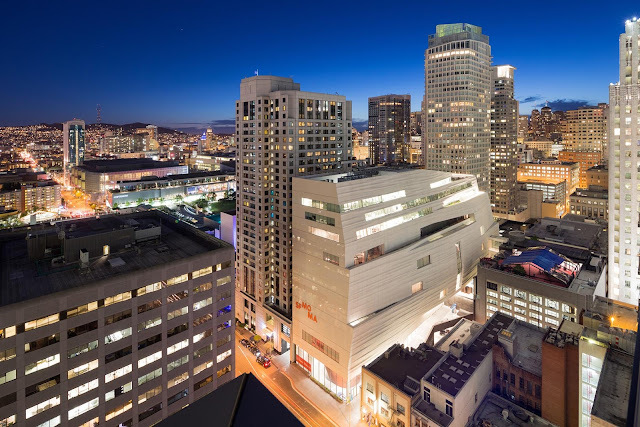 SFMOMA was the first museum on the West Coast devoted solely to modern and contemporary art. 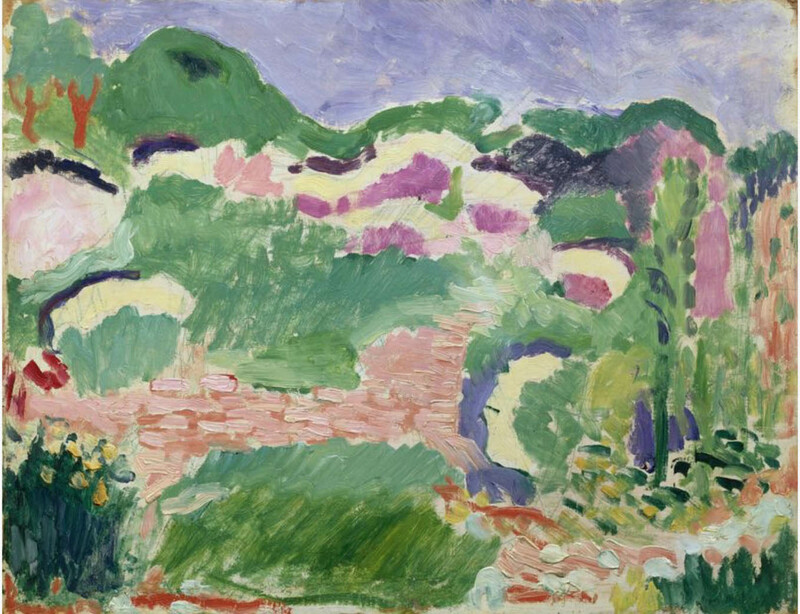 1936: The museum’s second year offered an exhibition of works by Henri Matisse — the first on the West Coast — primarily drawn from two local private collections. 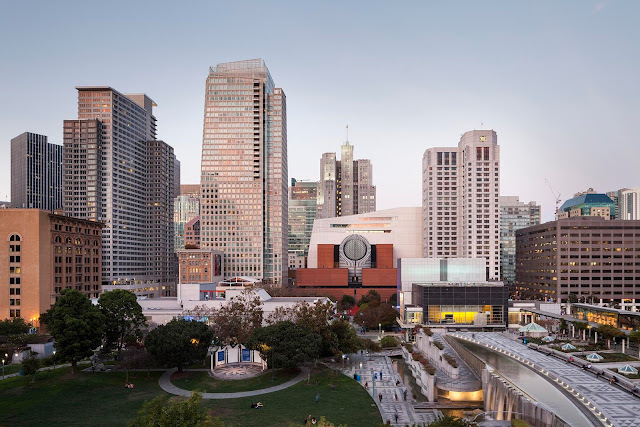 The San Francisco Museum of Art becomes one of the first museums to recognize photography as a fine art by establishing, under the guidance of Curator John Humphrey, a collection of photographic works. 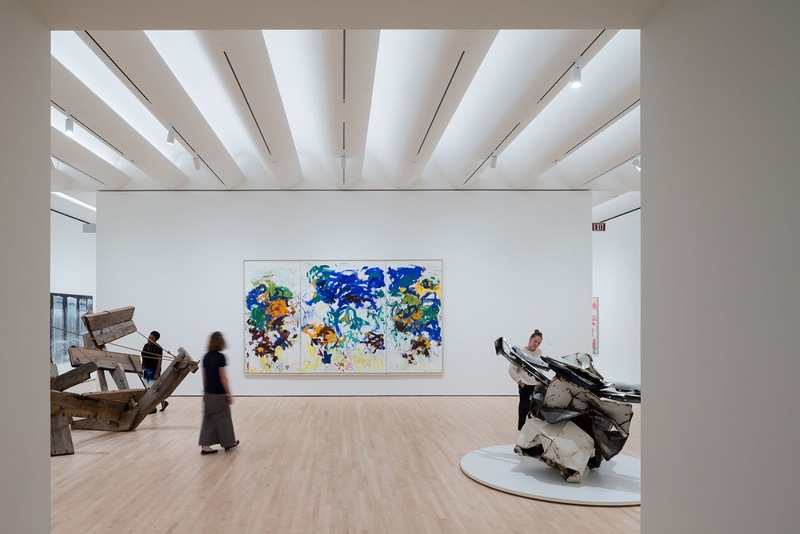 SFMOMA was the first museum to present a solo exhibition of the works of Jackson Pollock. Eventually the museum left the Veteran’s Building, and moved to SOMA into a new Mario Botta-designed museum that forms the center of the new Snøhetta center. 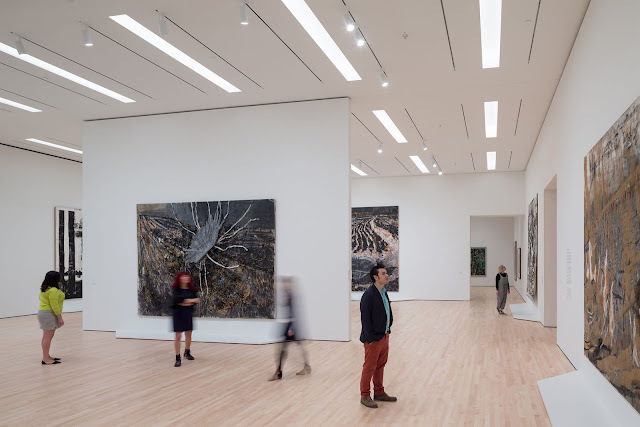 After a three-year closure, the newly transformed and expanded San Francisco Museum of Modern Art (SFMOMA) opened its doors to the public on May 14, 2016. 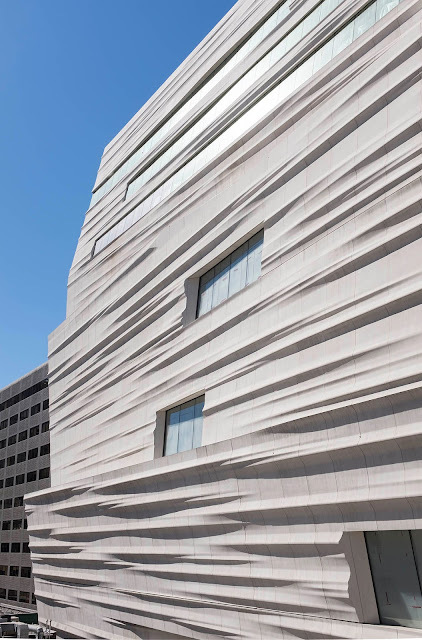 With nearly three times more gallery space than before, the museum opened with 19 inaugural exhibitions. The curated selection from the distinguished Doris and Donald Fisher Collection is the highlight of the museum. 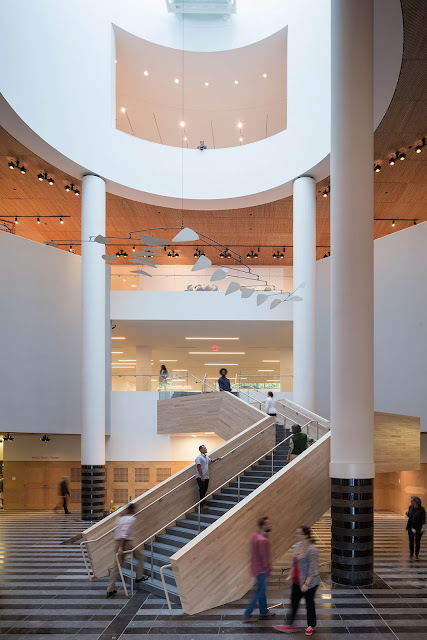 There is a floor devoted to the fantastic Pritzker Center for Photography, as well as favorites from SFMOMA’s permanent collection, and works specially commissioned for the new museum. SFMOMA now includes nearly 45,000 square feet of art-filled free public spaces. A café, and restaurant, In Situ, designed by Aidlin Darling Architects, will open soon. On the 3rd floor is Sightglass coffee bar, with pastries by Patisserie B (sometimes, alas, sold out). SFMOMA will offer free admission for all visitors 18 and younger in perpetuity. 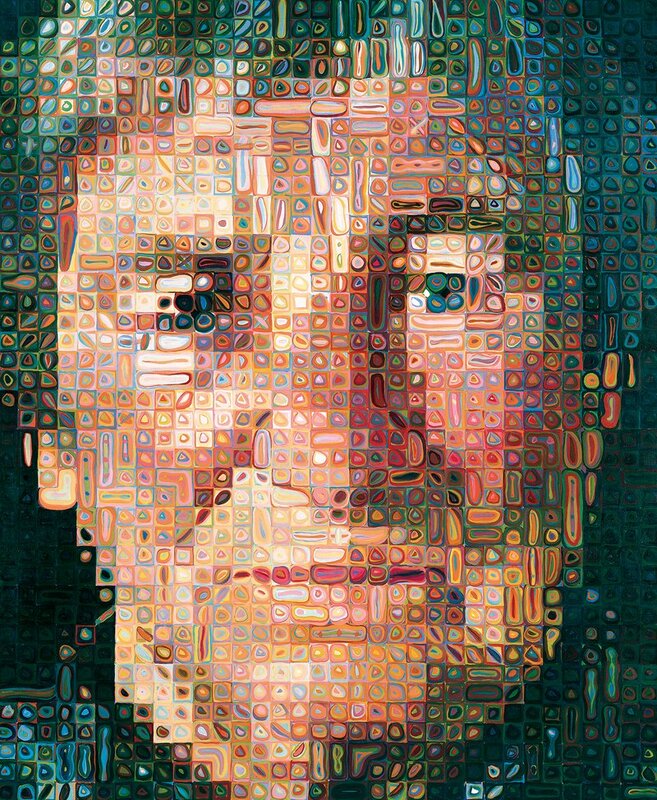 Spend time and take a close look at this subtle and lovely show. 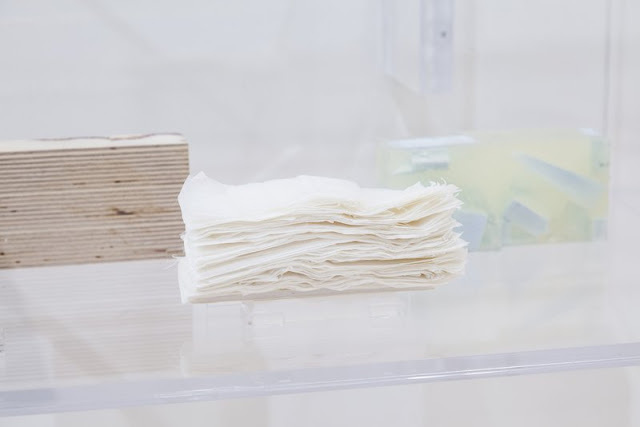 It shows how began to conceptualize the museum, using low-key and playful materials like tissue paper, resin, wood, old newspapers, and plastic. It’s fascinating to see that from their initial concepts—the ideas were refined and examined but the floating abstract layers remained the same. This is one of my favorite exhibits in the museum. As a practice, Snøhetta architects begin each project by identifying a set of conditions inherent to the site — not merely its physical setting, but also its cultural context with the goal of designing spaces that frame a condition, direct attention and provide a deliberate experience. More than 50 sketch models and five sketchbooks on view offer perspective on the process behind the SFMOMA expansion design, and a new mobile app provides an additional museum experience of built architecture with a narrated walk-through of key design decisions in the new SFMOMA. The new museum project was led by the museum director Neal Benezra, along with Gary Garrels, senior curator, and Ruth Berson, a deputy director who oversaw the three-year architecture expansion. German artists who emerged after 1960 explored their postwar landscape — situated between recent disaster and emerging prosperity — with a combination of skepticism, uncertainty and excitement to begin anew. 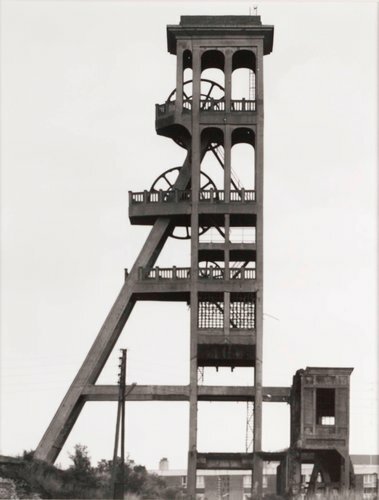 Drawn from the Doris and Donald Fisher Collection, this exhibition features monographic galleries devoted to leading German artists Georg Baselitz, Bernd and Hilla Becher, Sigmar Polke, Anselm Kiefer and Gerhard Richter. 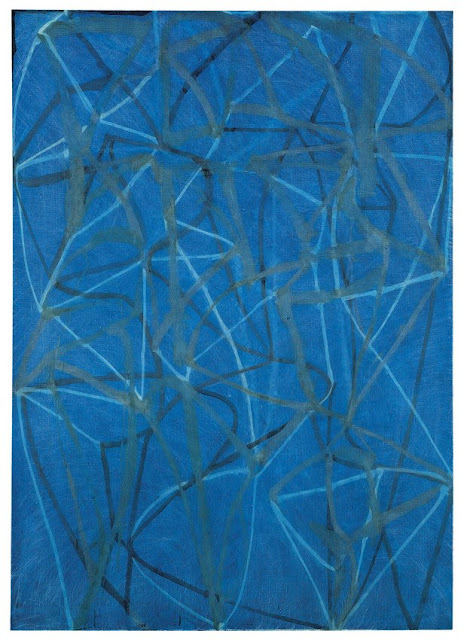 This exhibition explores the diverse approaches to abstraction developed since 1950 by selected American artists in the Doris and Donald Fisher Collection. 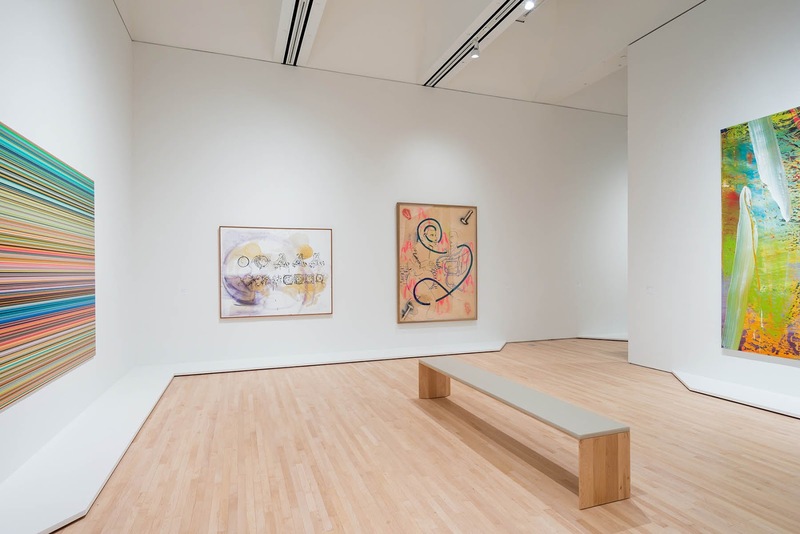 In luscious paint strokes, luminous planes of uniform color and dynamic constructions of wood and metal, the nearly 80 paintings and sculptures assembled illustrate artists’ individual ideas about the making and meaning of abstract art. Highlights on view range from the forceful brushwork of Lee Krasner’s Polar Stampede (1960), to the enigmatic wood forms of Martin Puryear’s Untitled (1990) and Malediction (2006-2007) to 26 contemplative canvases and reliefs by Ellsworth Kelly and an intimate, octagonal-shaped gallery devoted to Agnes Martin. 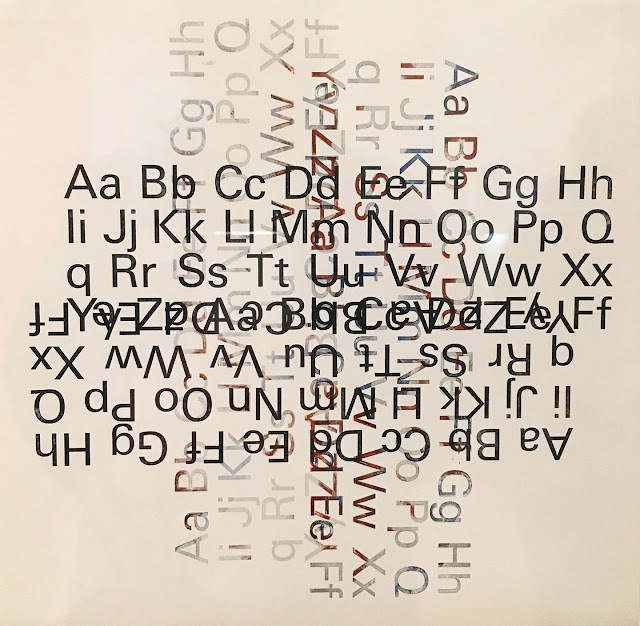 Typeface to Interface notes the shift from analog to digital in visual communication, and includes important examples of communication tools that have shaped our relationship with graphic design. 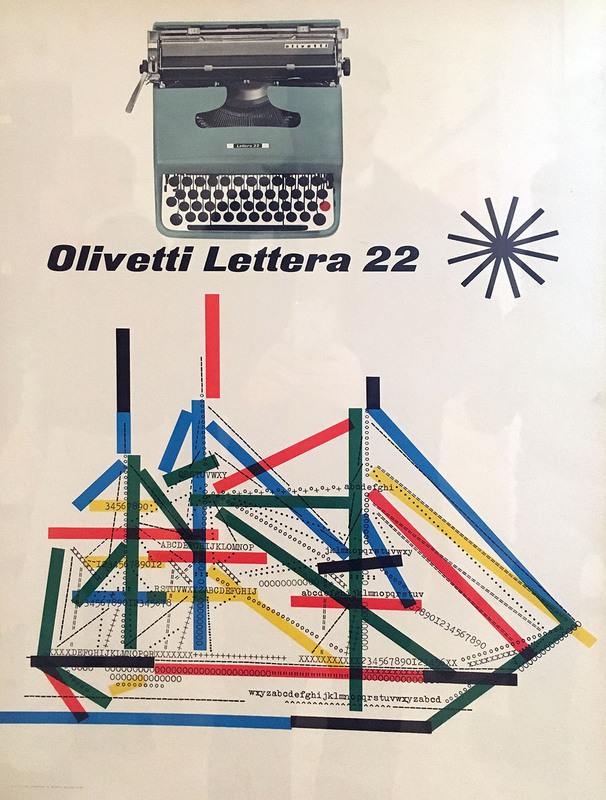 Oscillating between structured formalism and free form expression, the works on view illustrate the rapidly evolving field of graphic design. 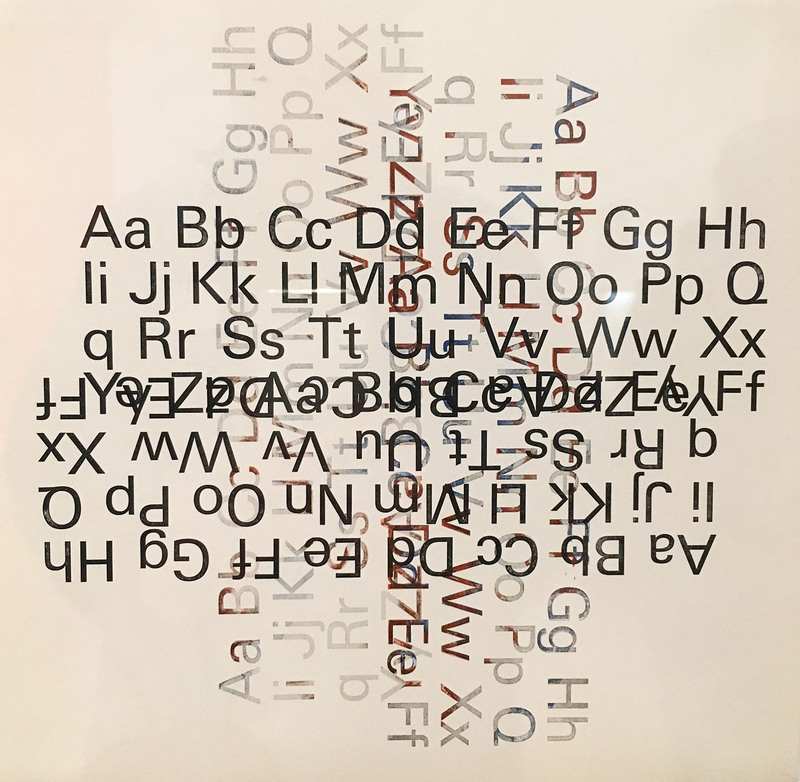 Advertising, wayfinding and information systems are displayed alongside artistic and conceptual experimentation, providing a view of the progressive discourse on what graphic design is and how it is used. Underscoring SFMOMA’s commitment to the art of California, and the Bay Area specifically, the inaugural installation of the museum’s California galleries feature artists in three groupings: artists associated with the University of California, Davis, including Robert Arneson, Wayne Thiebaud and William T. Wiley; art by Joan Brown, Jess and Lee Mullican, emphasizing the personal, often spiritual, underpinnings of art produced in the region; and the Bay Area’s vibrant Conceptual art scene of the late 1960s and 1970s, explored through works by David Ireland, Lynn Hershman Leeson and Tom Marioni, among others. Daily, 10:30 a.m., Thursdays, 11:30 a.m. Featuring approximately 180 photographs — many of which have never before been seen or published — Anthony Hernandez is the first retrospective to honor the more than 40-year career of this major American photographer. Presenting the full scope of Hernandez’s work, including black-and-white and color photographs, the exhibition celebrates the artist’s unique style of street photography, and how it has changed and developed over time. 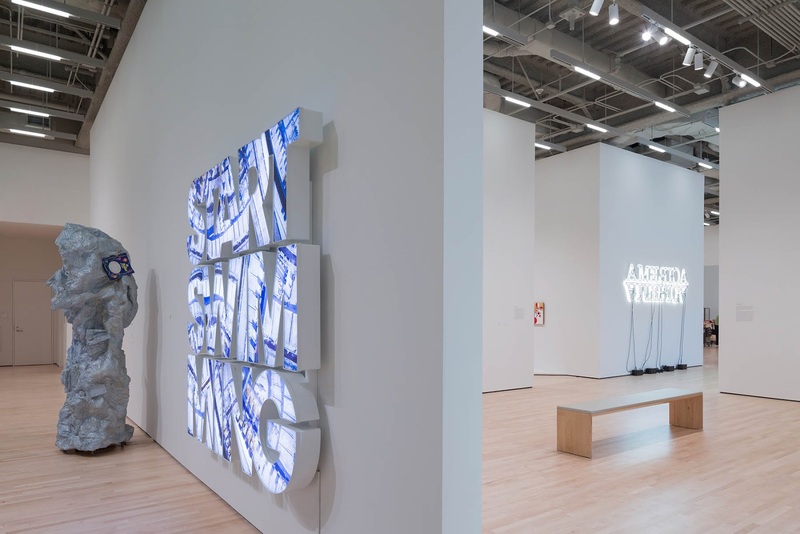 California and the West consists of nearly 200 gifts and promised gifts to the museum that depict wild nature as a spiritual resource and native heritage, illustrate how land has been used over time and explore diverging photographic approaches—from documentation to self-conscious art making. 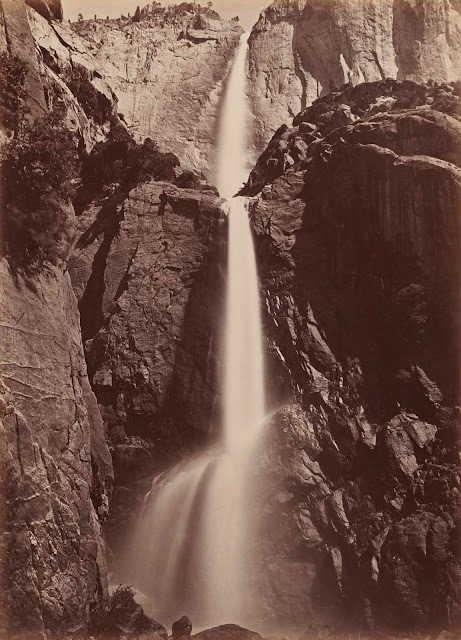 Arranged chronologically from 1856 to 2014, the show reveals works by Ansel Adams, Manuel Álvarez Bravo, Lewis Baltz, Imogen Cunningham, Lee Friedlander, Jim Goldberg, Dorothea Lange, Ed Ruscha, Peter Stackpole, Larry Sultan, Carleton E. Watkins, Edward Weston, Minor White and others. Principal photography courtesy SFMOMA. Photography by Henrik Kam, John McNeal, Iwan Baan and Joe Fletcher. Note: SFMOMA is committed to protecting the copyrights and other intellectual property rights of creative artists and other owners of intellectual property rights. 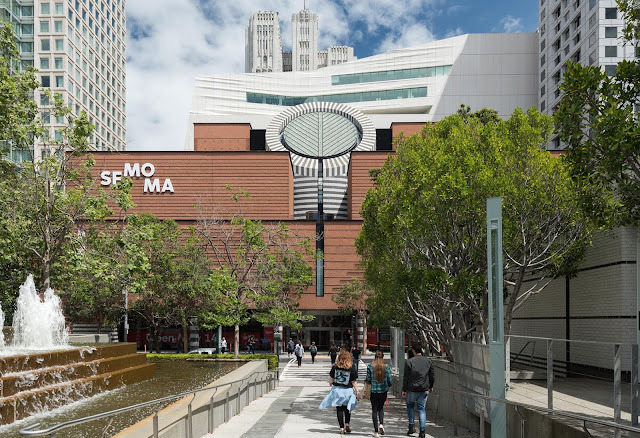 SFMOMA grants permission to use image(s) only to the extent of its ownership rights relating to those image(s). Certain works of art, as well as photographs of those works of art, may be protected by copyright, trademark, or related interests not owned by SFMOMA. The responsibility for ascertaining whether any such rights exist and for obtaining all other necessary permissions remains solely with the party reproducing the image(s). 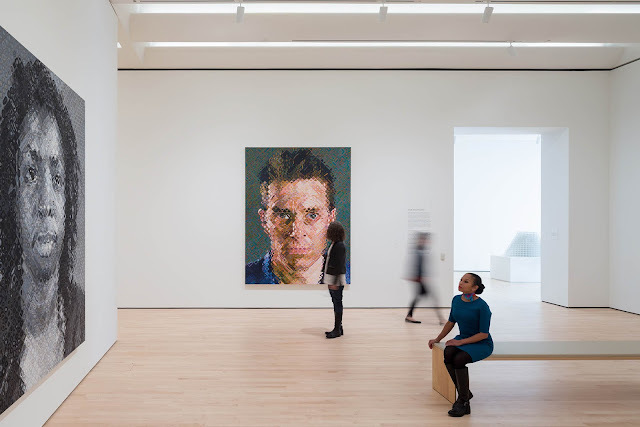 SFMOMA reserves the right to request copies of such permissions. In addition, image(s) must be reproduced with notice of attribution, and the party reproducing the image(s) may not crop, distort, mutilate, or otherwise modify the image(s) in any manner that would prejudice the artwork or the artist’s honor and reputation. Additional photography by Brian Dittmar, Art Director of THE STYLE SALONISTE, and founder of Brian Dittmar Design, www.briandittmardesign.com. Most of the current exhibits are on view through August, and some through November. Check with their helpful ‘visitor experience’ staff. I hope you loved and have printed out (it looks like a magazine)…my 'Diane's Trip' and tour of SFMOMA. It was such a pleasure to research this--and work out how to negotiate and enjoy the museum. Wow Diane – what a thoughtful, comprehensive piece. Thank you so much for putting such time and effort into sharing our experience with your readers – we really appreciate it. Please let us know if you’d like to come back – you’re always welcome!